Fabulous! Perfect for me... I am a professional author. Sometimes I need to get my thoughts down as soon as I can ...so I don’t loose an idea. This tool is amazing! Love the voice to text feature ....super! It is a wonderful apps .help you to organize your work and email when needed. I like it . I enjoy using this app. The ability to take minutes at meetings is made and transferring to any other document is easy. Thank you so much. Recommend to ALL!! EXCELLENT file keeping and Secured. Really like the app. I use for note taking and it’s a great way to track and organize documents. Nice, keep the updates coming. I use this almost every day. I use it to file and convert my documents into pdf. Very useful and helpful. Love, love, love it with document you can create and customize your own documents for business purposes personal and for fun most of all you can export documents to your Google, box, drop box, cloud, iCloud to have available any where you go! To share with whomever you like! Malek Eloukaili. I have been using this office App on my iPhone for the last decade till to date. It has saved me the headache of papers and files. I run with it all my office and excels efficiently and very smoothly. I do encourage on using it as a mini office document app. Does word, pdf and all kinds of text files including books. Great for creating quick sheets for business! And managing home budgeting sheets! I upgraded to the full version thinking it wouldn't just close the app but it still does it. It keeps saying it is unable to save. Then to make it worst, if you open the file from one of your iCloud device and reopen it from your iPhone or iPad it changes the file extension. It works good only if using it in either iPad or iPhone. I use this app routinely to allow ready access to documents, slide sets, etc. By far my most favorite app to use, security options with Touch ID or Face ID. I would love a search feature to find info that I have stored on this app. Keep the updates coming!!! I love to save documents to my phone and don’t need internet access to view them. Fortunately, this app follows the KISS principle! Documents is a deceptively powerful app. I use it in preference to Google docs because I find it simpler to use but has all the features that I need. Excellent app! I like the program pretty well, but I wish it had a tutor option. We use it much in synchronizung our files. I found Documents to be very user friendly. Use it a lot and appreciate how good it works each time I use it. TERRIFIC!!! Review thingie so the app will stop asking. Have been using this for the last couple of years for my writing when I'm away from my laptop. Upgraded to the paid version and I don't regret it at all. A few bucks spent nicely, tbh. 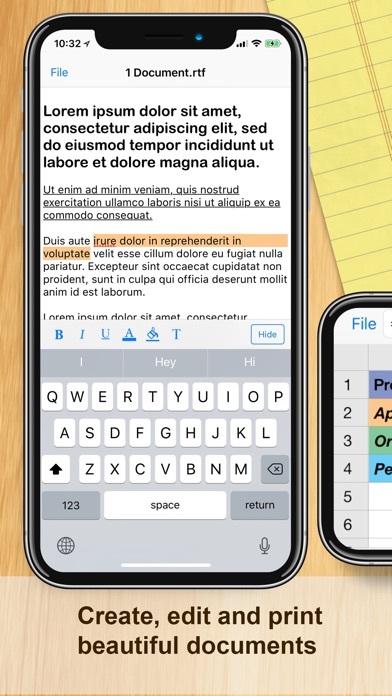 Very accessible with voiceover, which is Apple's screen reading software for the blind. Great but sometimes I have to save a document twice before it shows up in the folder. Great app though. May just be my phone to be honest. It can be slow and glitchy so this may not be the apps fault at all. Good app! Easy to use! I've being using it since couple of years and is excellent. You need to learn a little bit about documents savings but once you got it you'll never want to change it! Small, yet effective and versatile. Gets many a job done effectively. Could benefit from more user-friesdliness and intuitiveness. Able to play streaming music URLs in the browser with minimal footprint. the app doesn't open documents from the web or other apps like Microsoft Word. For being a free app, I truly love this one. It is very user friendly and I am able to use my iPad like I would my laptop. It has a word document and a spreadsheet function that works well for me. I have not had any issues with saving items that I want to keep with me at all time. I can even use this on my iPhone. I have not been able to retrieve my documents since the update. Unlike Microsoft, you aren’t charged a monthly fee for use. It’s not as portable for forwarding but it’s a great product. Great app. Best part is that you can extract files from multiple places like Dropbox and Google Drive. Enjoy. I have finally found a good word processor for my IPad. Now I can write with confidence. Can't wait for the ability to insert pics or other docs into my work. Great job, thank you for this wonderful app. I upgraded to the full version thinking it wouldn't just close the app but it still does it. It keeps saying it is unable to save. I really like Documents. When I was new to work apps, I tried several and Documents was far and away the easiest to use without sacrificing any capability. It's fully functional in all the ways I hoped it would be. It’s as good as you make it. The more you use it the more you’ll like it. Very easy to use and helpful Love It!!! I have been using this app for several years and it works exactly as I need. Makes the tablet like a big pdf thumb drive. I use it almost every day, sometimes several times a day. No need to boot up a laptop or desktop, just touch the app icon! And easy way to keep your important documents in an easy to reach an organized manner. Notes are easier to keep up with now, thanks. I'm using this app already for more than 3 years and i love it so much. as a totally blind iOS voiceover user, it is so humbling to see developers like these people who take accessibility standards in the consideration when coding there apps. This app is simply put, amazing! Works beautifully with voiceover, and is completely feature-rich. I couldn't ask for a better app. All the cloud services I need are in a graded, and it works absolutely flawlessly with my series 3 Apple Watch. note to the developer, thank you thank you thank you thank you! This is a dream come true of an app. with warmest regards, Chris. Very easy to use. You can copy and paste from other documents, templates or pages of web sites, edit, and save. Worthless POS ! I BOUGHT this because it said you could EDIT docs...you cannot...you can open it (with effort) look at it...you CANNOT EDIT on it ! Deceitful ...saver your money ! I keep recipes in Documents on my phone so I can refer to them at the grocery store; poems & song lyrics; drafts of documents I'm writing. Love this app. Great capacity, easy to search for files and easy to set up folders. Lost all my documents. Hard to work with. Great document management tool. Wish it had the ability to search within a document but otherwise perfect. Spent the money on the paid version not because I needed the extra features but because I wanted the thank the creators for a great product. I use this app every day and I like it. However, there needs to be better access to support. I sure hope that it does interface with the new iOS. I store lots of information using this app. Just about everything is great. Just needs the auto predict so I don't need to type in same thing over and over again in some columns. Been using this app for a few years now and I love it. Been using this app for a couple of years and it has proved to be a very handy tool to have for my important stuff. The only problem I have is understanding what each little icon at the bottom does. I don't know home to arrange my lines alphabetically without copying, pasting, and deleting. Just learning, so far, so good. ...which is fine, but can they at least tell you? I entered info into a doc and exited. The system asked if I wanted to save. I said okay. It said okay. Next day, the doc was gone. I prefer not to have my apps prank me, but okay App Developer, you got me. I’ve been using Documents for several years now, and it has worked well for me. The biggest negative is that I have it on my iPhone 8 and my fat fingers don’t type well on such a small keyboard. So easy and convenient on my iPhone 6s!! That works exactly the way it was planned it’s Programming Work good for me everything perfectly great for working. Great App I upgraded it not because it was needed free version worked wonderfully but I wanted to pay for it to support the awesome people who made this story. Downloaded & unzipped a very large file with no problems:) Thanks! Makes it easy to locate and search Internally within large files for any thing that you may be needing. The best...been using for several years...Love Documents! It takes a while to learn, not to user friendly but once you get the hang is it it is awesome. For security purposes, please add Face ID due Touch ID isn’t available on iPhone X. Adding Face ID adds security to documents like Touch ID once did. Overall documents is awesome app but would have given it a 5 star but need security for my documents. Using on one document now and looks like it may be pretty useful. Love the ease of using this app! 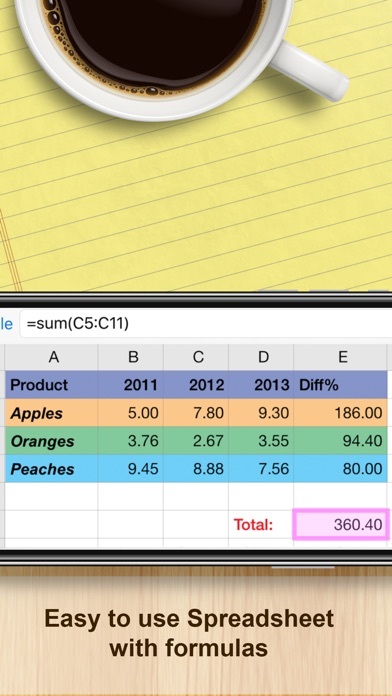 Love the spreadsheet function! Better than all I’ve tried including Excel. Recognizes spoken phone numbers and automatically formats! I am able to view my documents with my iPhone & iPad both!! Love it!! I've tried lots of these apps over the years and this is hands down the best. From top to bottom it's full functioned and professional. Wouldn't use any other. I wanted to edit an XLSX (Excel) document being displayed in the free version of the app, and it displayed a message that the Pro version must be purchased for additional functionality. I purchased the Pro version but it cannot be used to edit XLSX documents. No refund is available. I use the documents app all the time for work as it meets most of my needs. Thanks! Documents is an app where all types of files can be kept. I have used it for songs of my favorite artist. It is perfect for recipes and articles I want to keep on my phone. I would not want to do without it. Easy to download and very easy to use. 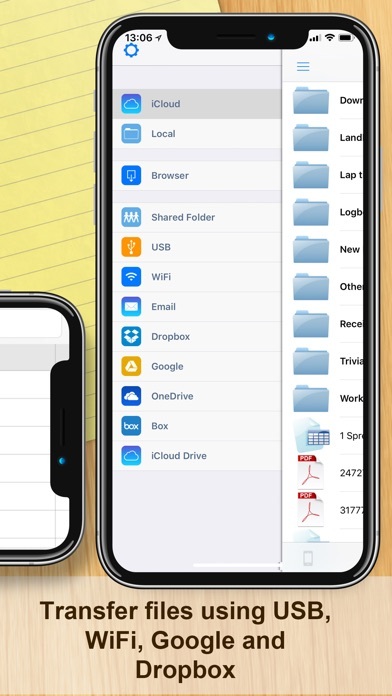 Definitely a good app to organize and store files. This is one of the best documents I ever use I like it better than word. I’m a man who needs to take notes. This application does the job just fine. I use docs to store many work related documents and it works great. I am not a techie and have a non user friendly smart phone & beginnings of osteoarthritis making typing growing more challenging and different; requiring utmost accurate and simplicity while not losing any of the features necessary for home or office duties, even fun. Giving several obstacles to tackle all at once, I wasn’t certain until trying this app as to how successful it would be. It’s assuredly, the most sensible, orderly and complete document application & more out there. It’s genuinely five (5) star worthy. This is the very fist time I have decided to rate an app. I feel for anyone struggling. Go for it! Safe & efficient. Glad I got the pro version. This app is really helpful to me in that it allows me to record messages as well as save valuable information that I can return to over and over again. Thank you! This is the second time that documents has completely lost my data. What a bad app. No way to get help that I can find. Stuff is just gone! I love using this app along with dictation on my phone or iPad to write reports for work. Very useful. Great app!